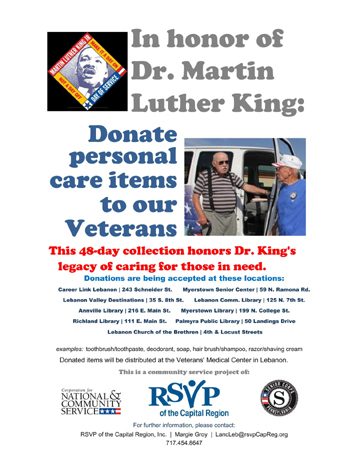 This collection honors Dr. Martin Luther King Jr.’s legacy of caring for those in need. Donations are being accepted at the locations shown to the left. Examples of personal care items being sought as donations are: toothbrush, toothpaste, soap, deodorant, hair brush, shampoo, body wash, razors, combs and shaving cream. Help the residents of York County PA! 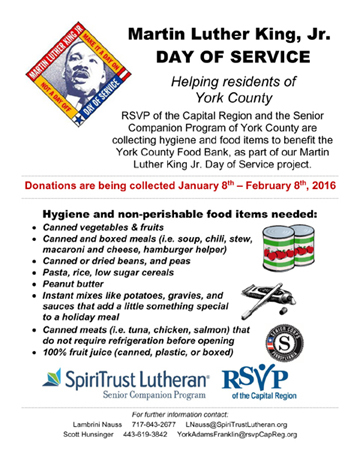 RSVP of the Capital Region and the Senior Companion Program of York County are collecting hygiene and food items to benefit the York County Food Bank, as part of our Dr. Martin Luther King, Jr. Day of Service. 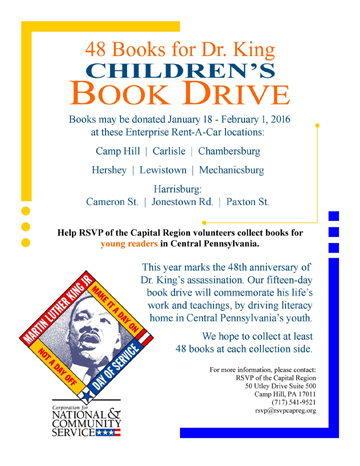 Your donations are being collected from January 8 through February 8, 2016.